The food was fresh and the drinks were pretty fairly priced. As any die-hard „Vanderpump Rules“ fan knows, castmembers Tom Sandoval and Tom Schwartz’s collaboration with Lisa Vanderpump and Ken Todd officially opened its doors and TomTom season is officially here. And while the opening night (filmed for an episode of Bravo’s reality show „Vanderpump Rules,“ naturally) and the press preview delivered images of a TomTom packed to the brim with Bravolebrities and opportunities aplenty for face time with the Toms, that’s not exactly how things go down at the fourth West Hollywood Vanderpump creation on a daily basis. Life doesn’t often imitate reality TV, after all. To find out what it’s like for the average Vanderpump fan, I ventured out to the brand new bar and restaurant on a Friday night. And it was actually kind of fantastic. Of course, a few factors lined up perfectly. For starters, I’d heard there was a line out the door to get into the place on most popular nights, so I nabbed a seat just after the doors opened at 5:30 p.m. The result was a prime bar spot, smack dab in the middle of the front parlor. It was close enough to the front to watch people walk by and realize they recognized the bar from TV and to keep an eye on the famous giant portrait of the Toms mid-kiss. As a bonus, I decided to visit the bar a few days before Halloween, and as it turns out, TomTom’s decor is kind of perfect for those synthetic spiderwebs that we all love so much on the spookiest holiday of the year. So, pro-tip: plan your TomTom visit for next October. Not only were the staff welcoming and surprising chill with the knowledge that 90% of their customers were bound to be fans of the Bravo series, but the foods and drinks were actually pretty wonderful too. 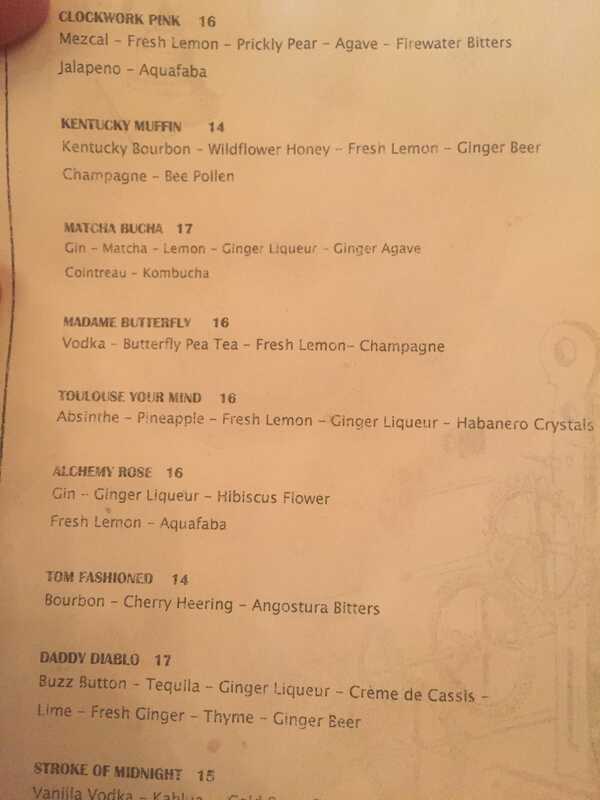 I had heard that some of the cocktails were a bit off (and having been to SUR, I can attest that Ken and Lisa’s hot spots don’t always have the best cocktail inventions), but would wholeheartedly recommend the Toulouse (named after Toulouse Lautrec, made from Absinthe, pineapple, fresh lemon, ginger liqueur, and habanero crystals, and topped with a tiny red rose). It’s only a tad spicy, great for Instagram (especially if you nab a spot at the marble bar), and it’s got a delightful, unique flavor without being over-the-top sweet (like so, so many Vanderpump cocktails tend to be). But since the drinks at TomTom are pretty strong (which is great since they’re $16 bucks a pop), I couldn’t leave without getting a little something to snack on, too. The tacos are an extremely LA dish, eschewing the usual corn tortillas for jicama, cut into thin, tortilla-esque slices. 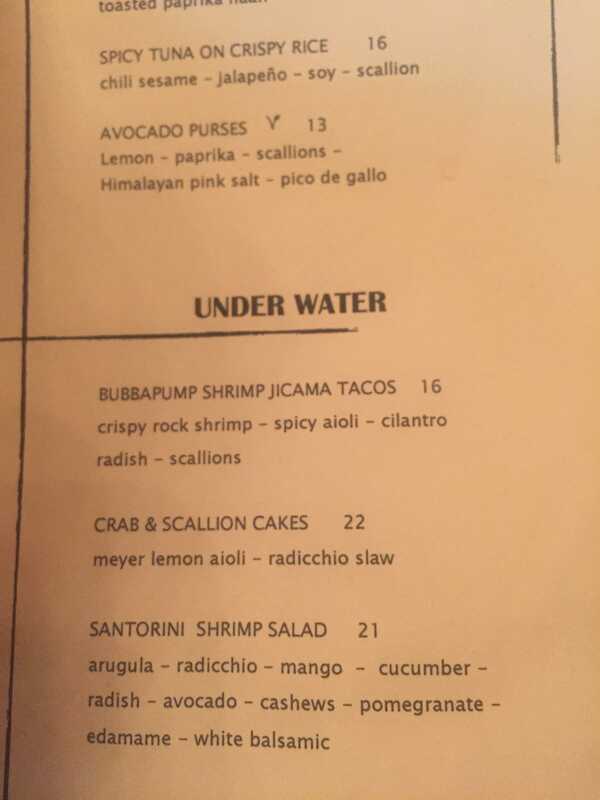 I initially assumed that this choice was done for low-carb reasons, a concession to offset the fact that the shrimp are deep-fried, but after (quickly) finishing off all three tacos on my plate, I have to confess the jicama switcheroo is kind of genius. First of all, the cool, veggie shell not only offsets the actual calories of the breaded shrimp, but it’s gives a genuinely nice counterbalance to the greasy fried seafood element. Secondly, because the jicama is a bit sturdier than a corn tortilla, the tacos hold together much better than actual tacos. Add to that a legitimately delicious spicy aioli with radishes and cilantro on top, and these little low-carb tacos might actually be the perfect cocktail snack. The restaurant could open its doors to Bravo fans and charge an arm and a leg for everything on the menu and probably still do alright. Instead, the prices are pretty in line with most upscale LA eateries (around $14-16 for an appetizer, $16-24 for most entrees, and $16 for most cocktails). The beers are a little too expensive for my taste ($10 dollars for a Peroni when you could buy the same beer as a six-pack for $7), but if you’re having a beer at TomTom, you’re missing the point of TomTom. TomTom is a pretty decent place to stop for a drink or two and some snacks. And while, yes, there are far better restaurants in West Hollywood just steps away from this place, they don’t all promise the same immersive Vanderpump experience. So go for it, Vanderpump obsessives. Nab a table, soak in the little details, and make sure you order a Sandoval original.